Super8MAX Ultra16 conversion for film, moviecameras with new electronics plus HDTV! 1080p HDTV System (max 30fps) HDTV with a Super8 camera! 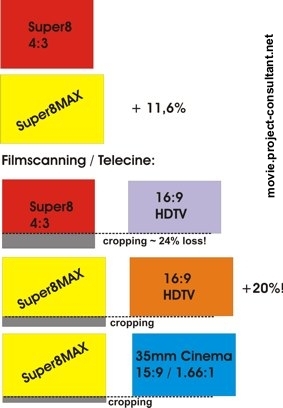 The Super8MAX filmgate uses 12% more of the Super8 film : the area which was formerly reserved for the soundtrack. HD telecine has now better results. And also blowup to low budget 16mm / 35mm cinema! The camerabodies are dismounted, cleaned, lubricated and modified. The old electronics has to be removed. New designed electronics with microprocessor, LCD-panel and control buttons are mounted. The optical system for the Super8MAX filmgate is slightly off-centre, but because it's such a small gauge no realignment is necessary! 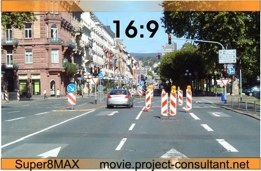 The viewfinder was not designed to "see" the wider frame. Therefore, you have to compose the shots with this unmarked/unseen area on the right-hand side in mind.